Too much bleach and sun exposure of late has left my hair looking frazzled, dried out, and just a little bit *meh*. Not a good look. I tried all the high street faves, leaving my Aussie 3 minute shine mask on for 10 minutes, John Frieda, the L’Oreal one with pearly bits in, you name it, I’ve tried it, but my locks were just not responding. 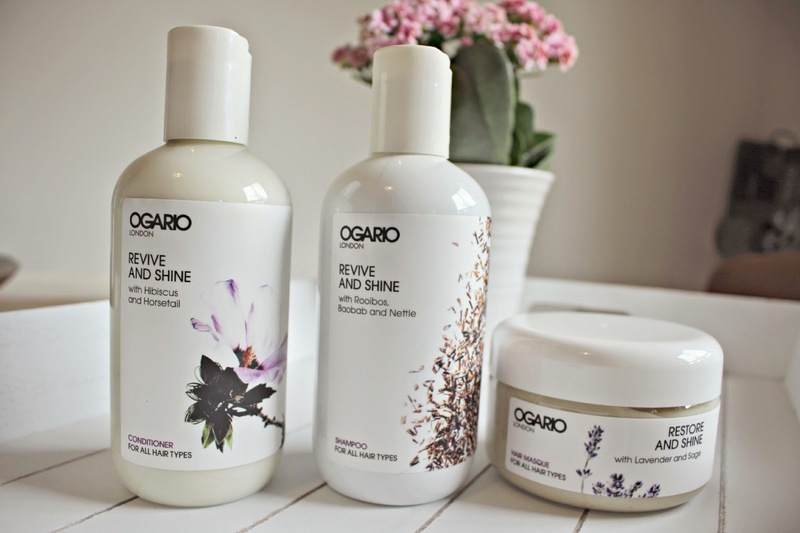 With perfect timing, a week before my graduation, this rather pretty little trio from Ogario London appeared on my doorstep with promises to boost shine, nourish and restore hair. The result? After a quick blow-dry (quicker than usual because my hair was far easier to detangle!) my hair felt light, swishy, and noticeably glossier than any after any previous products that I’ve tried. My hair felt so smooth I just couldn’t stop running my fingers through it, and I found no need to straighten afterwards as I was quite pleased with how it fell naturally. The Revive and Shine Trio is £63.50 for all three products, and you can purchase the set online via their website here. If you are looking to treat yourself to a luxurious set, then I would most definitely recommend Ogario! Have you tried it yet?